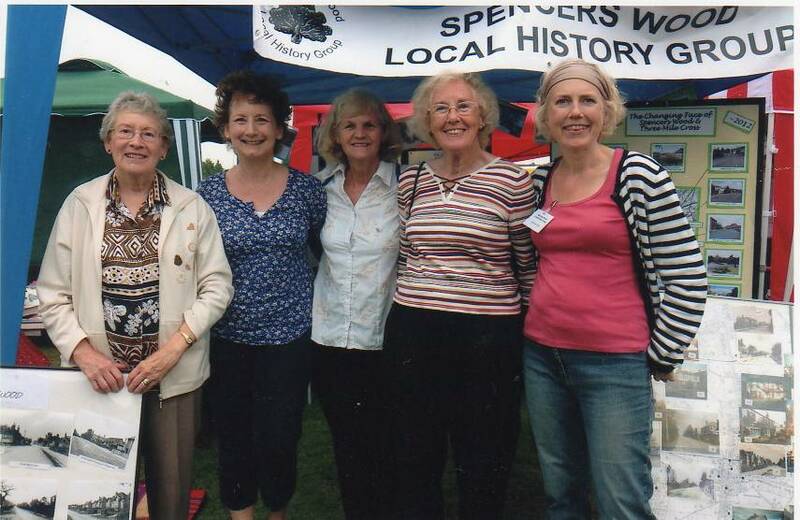 It is good that the new Co-operative shop in Shinfield is involved with the community but there was also a shop in Spencers Wood some years ago. This one was established in 1921, by the Reading Co-operative Society (RCS) whose Headquarters was in Cheapside, in Reading, in premises owned by McIlroys. Primark, in West Street, occupies these premises today. 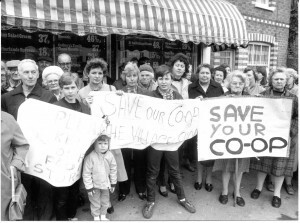 The Co-op in Spencers Wood was very popular and lasted until the mid 1980s when many protesters objected to its’ closure, to no avail. Before this though, the building housed a small confectionary shop run by Miss Horwood whom the local children called ‘Aunt Em’. Miss Horwood surrounded the shop with a large number of Huntley and Palmers biscuit tins and there wasn’t mu ch space for sweets. When the shop closed in the 1920s, RCS updated it making it into a modern grocery store. In the early days, the customers would have been personally served by shop assistants after having queued, until shopping was revolutionised by self service with baskets, trolleys and checkouts. The building and car park was originally owned by Edwin and Mary Dearlove who ran a nursery and landscape gardening business. 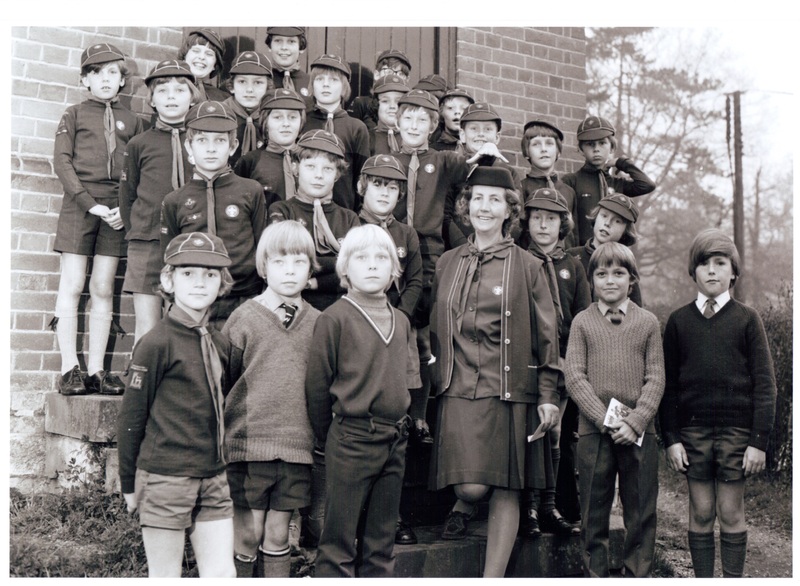 They had a large family of nine children, some of which went to Spencers Wood School at our library today, and when Lambs Lane School opened in 1908 they transferred there. William, Thomas and Frederick Dearlove went to school from the tender age of three years. The family was there from early 1900 and left for Reading in 1912 as recorded in the Lambs Lane register. The business transferred to Whitley Street and had nurseries that went through to Kendrick Road. We know nothing about the building before the Dearloves were there but when the Co-operative left, the building was occupied by Delby’s, the refrigeration company. When they moved to Wootton Grange the building was purchased in 1991, extended and occupied by the Society for General Microbiology (SGM). It was this society that called the building Marlborough House. The Society was first formed in 1945 with the first president being Sir Alexander Fleming. As its’ title suggests, the society professionally studies all aspects of microbiology, giving lectures and writing papers for public interest, nationally and internationally. In 2013, the Society moved to London and is now situated at Charles Darwin House. The premises have been sold and we wonder who or what will arrive next. The 1881 census does not really differentiate between the villages – be it Grazeley, Three Mile Cross, Shinfield Village or Spencers Wood. Our group have spent some time as this data becomes freely available this information, and we have highlighted what we know to have been Spencers Wood. According to the census, there were 184 individuals living in the area. 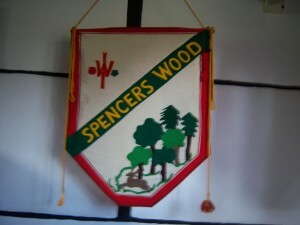 The majority of those individuals held positions in service to two of the largest houses in Spencers Wood – Stanbury House and Highlands. Both had a butler, 2 housemaids and a kitchen maid. Highlands had their own cook, whereas Stanbury had its own footman! Over 20% of the population of Spencers Wood was “in-service” in one way or another. In total our village had 56 children and 30 wives. This was the fourth highest number in the census. 19% of the children were classified as “scholars” and an additional 11% were under school age (below five years old). 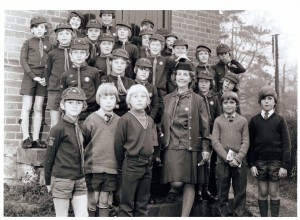 Since there was no compulsory state education until the 1880 Education Act, when school boards were first formed, only four of the wives were in employment and the rest remained at home to look after their children. The 29 farmers and individuals associated with agriculture (e.g. cowmen) are nearing 16% of the total population. The total farmland (excluding market gardens) was 654 acres or 366 football pitches, with Charles Portsmouth holding 290 acres, with 10 men and 4 boys. 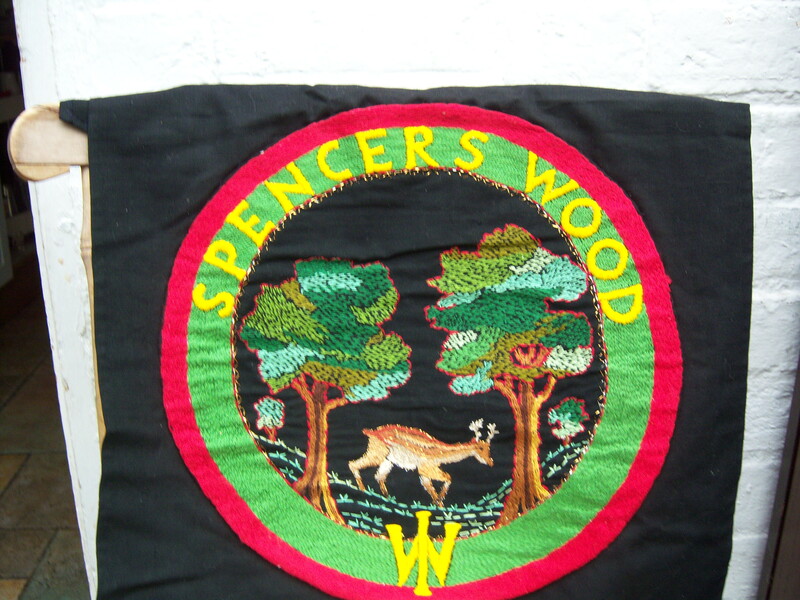 Much of that farmland has slowly been built on as Spencers Wood population has grown, and the demand for housing and schools has increased. 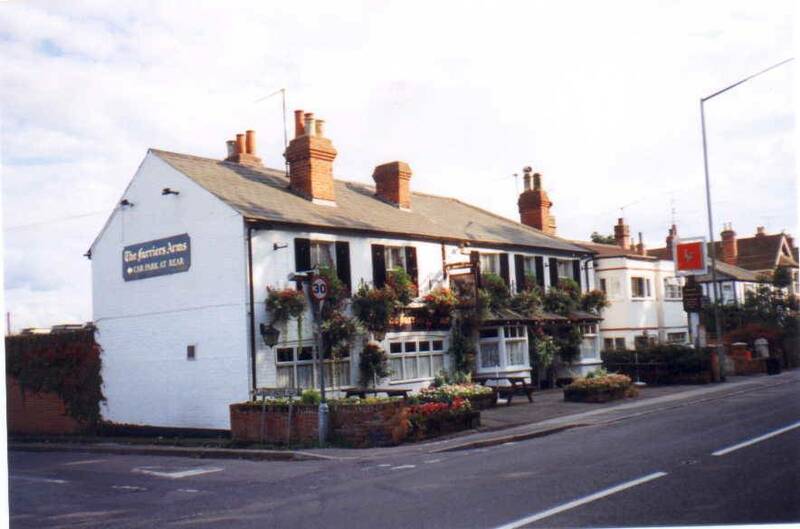 The census lists the Cricketers Inn, (now the Hop Inn), the Star Inn and The Red Lion (opposite the Post Office).Often the pubs were combined with other activities – e.g. Farriers Arms was a blacksmiths originally; Yew Tree Inn was a farm of 20 acres. Over the years, many of these pubs have changed considerably, either being converted to houses or not generating enough business to stay open. Both the Star Inn and the Red Lion have been converted to residential properties. Some, like Yew Tree Inn, owned by a farmer George Arnott of 20 acres, was nicknamed “The Stump” and is now a nursery. Slowly the village was growing and the small businesses were growing up. There were six in total- One dressmaker, a laundress, a Wheelwright, a Woodman, a Wood Dealer and a General Shopkeeper. Beesley’s Stores stood next door but two to The Farriers Arms in the house now named Tintern and was set up in 1881 by Henry Beesley who came from Littlewick Green, Maidenhead. Beesley’s could well have been the first store in Spencers Wood (pictures and memories of Beesley’s Stores kindly donated by Lorna Merry). Do you know any different? 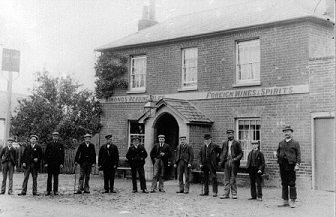 We are collating information regarding farms, pubs, small trades on our web site – www.swlhg.co.uk. Please email us if you have more information. SWLHG & Oakbank School – A collaboration! Spencers Wood Local History Group has joined forces with Oakbank School to produce two audio projects for their web site. The first is an interview with the school’s Head, Maggie Segrove. The focus being on her as a person and Head, rather than her role in the school – why she wanted to join Oakbank and how she found the school compared to other schools she’d worked in. The second project is very much aligned to the Radio 4 “Listening Project” and, if good enough, could be sent to ! As the first individuals to ever join the school six, now year 9 students, will take each other through a set of questions to gather feedback and thoughts about their first impressions of Oakbank. The History Group will team up with the Head of Year 9, and the young people record a three minute media clip; the best of which will be uploaded to the group’s web site. The overall objective is to extend the profile of Oakbank in the local community – thus recording history in the making! If you would like to know more, please contact us or Mr Sutton at Oakbank School directly. 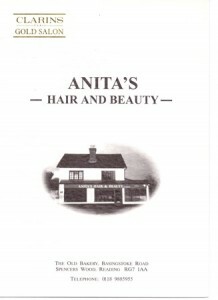 William Clements, aged 28, was recorded as being a baker at Anita’s, in 1891 employing his brother Arthur John Clements. 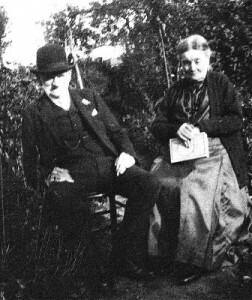 William died in 1902 and Arthur, born in 1873, took over as William left a widow (Emily Cordery) and five children. Arthur also brought his wife, his daughter called Susan, his mother and a sister Rose, from Henley, where Arthur was a journeyman baker. Arthur and family moved into Glanfield, a house (Upwey) alongside Spring Gardens in Basingstoke Road. From here Arthur also ran a horse drawn bus service between Reading and Swallowfield. Arthur purchased land originally belonging to Hunter of Beech Hill, near to Back Lane and built two semi-detached houses called Amersham and Bicester after places where he was brought up. One house became the Police House the other Arthur lived in. At the back, he had a grocery shop and built a bakehouse. Eventually he moved to The Limes, (Warings today) where he opened a grocer’s shop. He built a bakehouse at the rear installing the first ovens there. 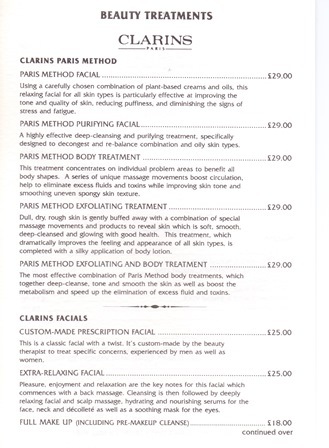 Arthur had seven daughters and the business was called Clements et Filles. He eventually had a son. The bungalow at the rear of Anita’s was built by Arthur at an unknown date (after 1918) to house his sister Rose, who never married. The other shop in Anita’s building was occupied by Albert E Webb, who was a saddler and from 1891, ran the business for 50 years. When Edwin Webb retired he built a bungalow called Saddlers on Spencers Wood Hill which has been recently demolished and a new house built. Behind William’s bakery, at the Summer House was Wilson’s 2d library and sweet shop, which could be Roses Bungalow but more likely to be an extension of the bakery. Herbert Wilson was there from 1935-1960 at least. Mrs Powell Clements was at the bakery from 1903–1920 and Emily Clements (William’s wife) was there from 1925-1931; Mrs Powell Clements is thought to be the same person as Emily. 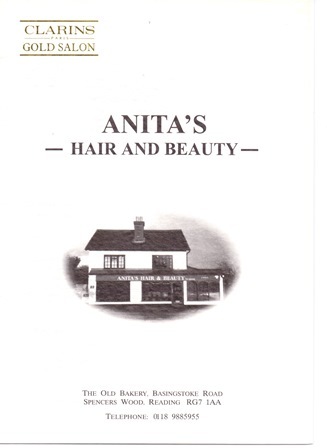 Edna Carter worked here in the 1960s and in 1966, Rosemary Hairdressers, was here. 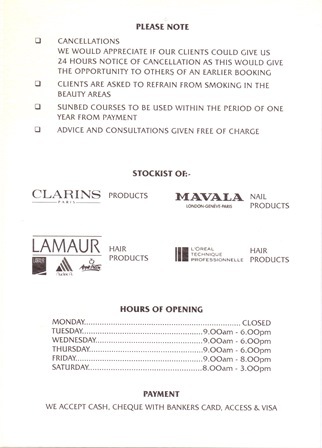 In the 1970s sometime, it was Michael Charles Hairdressers. 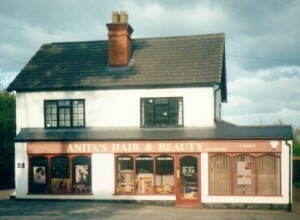 For a short while in the 1990’s, it was a Water Bed shop, followed in 1992 by Anita’s. The above is the result of an enquiry about Roses Bungalow made at the Carnival and we wish to thank Ron Holyday again, for his presentation at the Carnival. The date information has been taken from Directories and is uncertain. Private wells were dug sometimes at the edge of a property near a small stream or ditch, or they were put by the side of a cottage, even inside the kitchen where water was pumped up to a basin or sink. Outhouses for laundry, cooking or making ale often had a well in the floor. 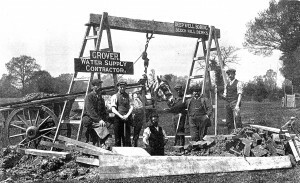 An important communal well was on ‘The Common’, opposite Spencers Wood Post Office. It was at a dip in the ground, and the head fittings with the pump and its enclosing shed were still in place in the 1980’s. Local families remember their parents collecting all their water here. Evacuees from London in WW2 recorded their astonishment at such primitive conditions! Digging a well was a complex and potentially dangerous job. We have a photo showing six men with their horse and cart from Grover’s, ‘Water Supply Contractor’ from Beech Hill, with timber for shoring the sides as they dug, and bricks to construct the well. Bricks were shaped as wedges to form the circular outline, and it is probable that the brick works west of ‘The Common’ made these special bricks. The Arborfield Brick and Tile Works provided hundreds of wedge-shaped bricks for many years. The well head would be a timber structure supporting the bucket and its winch. Later hand pumps were introduced to facilitate raising the water, often on routes between towns and near milestones. A farm in Grazeley still has a pump standing on the water supply line from a small reservoir through fields to the farm buildings. Electric pumps are now used where people have extraction rights to draw ground water for their gardens or animals. 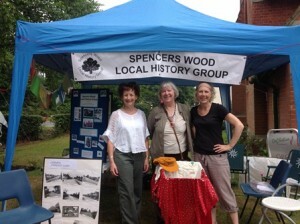 We had a display at the fete and gave out the prizes for the successful in the Treasure Hunt. Many children received a prize. What most of them didn’t expect was the downpour of rain we had. But there were no unhappy faces. In fact, everyone just carried on and we saw the arranged dancing while it poured. We did take some of the display down as it got very wet. At home afterwards, it soon dried out and we can use it again. The only disappointment was that fewer people visited because of the rain but we enjoyed ourselves and the children certainly did, running, dancing and getting wet through! Conversely the weather forecast was dire for this fete. The week had been hot and humid, and the previous nights had thunder, lightning and heavy downpours. We expected to be in the village hall. It was raining throughout the morning, and the gazebo was the last thing we expected to be putting up; however, the sun emerged at 11 am. As rain and lightning was expected later that afternoon, no one had set up under the trees, and many stalls were in the church. We had prime position, second stall inside the gates on the left, (we’re normally under the trees). It was really busy early on (people hoping to miss the rain) but as the afternoon progressed more people arrived as the rain was obviously going to stay away. We had put up the gazebo complete with our new banner! We all bought things from the surrounding stalls, and even had a winner on the silent auction! 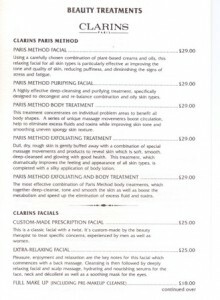 A number of new enquiries were received and a couple of pieces of information. 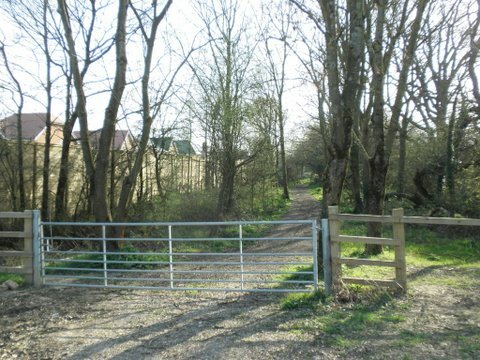 Woodcock Lane is an ancient track in Three Mile Cross, passing south between the villages of Three Mile Cross and Grazeley. It lies in the Foudry Brook valley and skirts the hills rising to Spencers Wood. 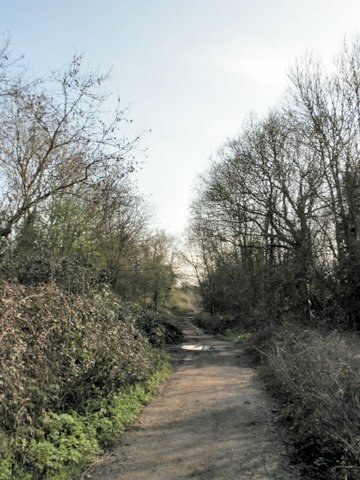 The Lane is shown on old maps and is named on Roque’s map of 1761, and Thomas Pride’s map of 1790. It is possibly named after after an old manorial family living in the area. Local land formed a detached part of Wiltshire until the county boundary revisions of 1884. In mediaeval times, lands were passed by kings to favoured religious groups and temporal knights, and just as land around the former Battle Hospital in Reading belonged to Battle Abbey, it is recorded that Robert Woodcock of the Hartley Battle estate paid dues to the Abbot of Battle in the fifteenth century. The Lane at one time lead to a modest manor house, Woodcock House. 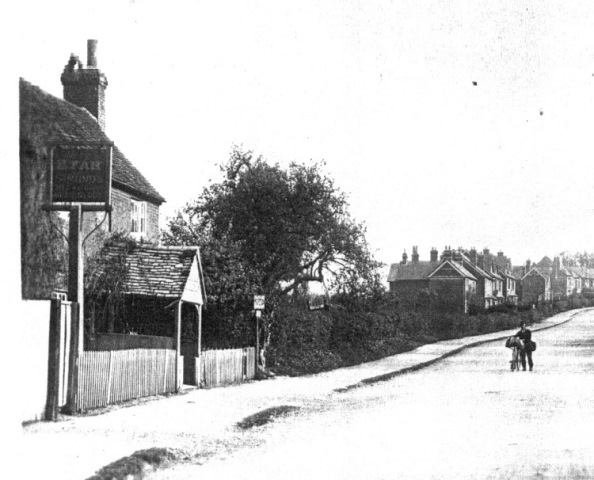 Three Mile Cross was a busy village community even before Mary Russell Mitford wrote in the 1820’s and 1830’s her series of famous articles later published in the book ‘Our Village’. 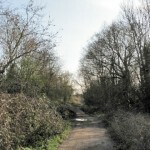 She describes the lane with its trees and wildflowers. In wet weather the track becomes muddy, and people preferred to travel up the hill to the south where the ground was drier. The author tells of seeing John MacAdam surveying both routes, to decide which to pave as the main road between Reading, Winchester and the south coast ports. 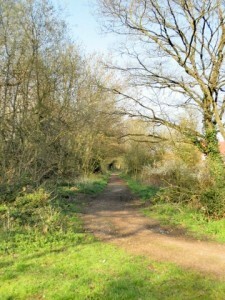 It was decided to tarmac the high road, and Woodcock Lane became a quiet green lane. Mary Russell Mitford chose to walk along the lane when she moved from Three Mile Cross to live in Swallowfield, sending her luggage by cart on the high road. Photographs and drawings in the late 19th and early 20th centuries show the Lane as a wide grassy track bordered by tall oak trees, with a double line of the trees on the east. Only a few old trees remain, and new younger growth surrounds the path. Land adjacent to the ‘low road’ was chosen for the A33 by-pass, leaving Woodcock Lane intact but subject to the noise of traffic. 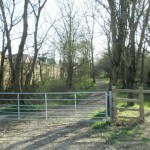 However, the Lane is a bye-way and footpath, and can be followed south into Hampshire. 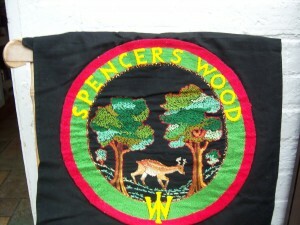 Within Shinfield parish, it is part of Parish Walk no.5, going along Woodcock Lane, up through wooded hillsides to Spencers Wood and back across fields to Three Mile Cross. 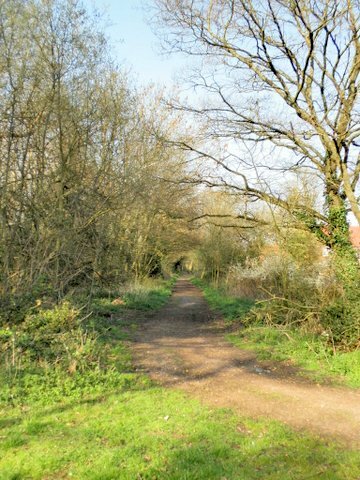 Walks leaflets are available from post offices, the library and the parish office as well as on the parish web site- The one for Woodcock Lane can be found here.